Not to be confused with Washington, Utah, a city in south central part of the county. Washington County is a county in the southwestern corner of Utah, United States. As of the 2010 United States Census, the population was 138,115, making it the fifth-most populous county in Utah. Its county seat and largest city is St. George. The county was created in 1852 and organized in 1856. It was named for the first President of the United States, George Washington. Washington County experienced the fifth-highest job-growth rate in the United States at one point. A portion of the Paiute Indian Reservation is in western Washington County. The earliest settlement was Fort Harmony in 1852. Santa Clara was established in 1854 as a mission to the natives who lived on the Santa Clara River. Hamblin and Pinto were settled along the Los Angeles - Salt Lake Road in 1856, as was Gunlock in 1857. Next came the settlements established as colonies to grow cotton, before the beginning of the American Civil War. They were located along the Virgin River, in the warmer climate below the Great Basin, that was called Utah's Dixie. The first were Virgin, and Washington in 1857. Heberville, Pintura and Toquerville followed in 1858, Grafton, Harrisburg and Pine Valley in 1859, Adventure in 1860, and Duncans Retreat, Northrop, Shonesburg and St. George in 1861. Fort Harmony, Adventure, Northrup were abandoned and Santa Clara, St. George, Washington, Harrisburg, Heberville, Grafton and Duncans Retreat, were nearly destroyed by the Great Flood of 1862 that followed 44 days of rainfall in January and February 1862. New Harmony, Springdale and Rockville were founded in 1862 by settlers flooded out of Fort Harmony, Adventure, Northrup and other places in the vicinity. Harrisburg was relocated. The Utah Territory legislature created Washington County on March 3, 1852. It was not organized at that time, and it was attached to Iron County for administrative and judicial purposes. This continued until February 23, 1856 when the organization was completed, Saint George was listed as the county seat, and the attachment to Iron was terminated. The county boundaries were altered a dozen times after that; its boundaries have retained their present configuration since March 10, 1892. Washington County lies at the SW corner of Utah. Its south border abuts the north border of the state of Arizona and its west border abuts the east border of the state of Nevada. Its terrain is rough and arid, with little area devoted to agriculture. It is a mixture of mountains and flat stretches. The terrain slopes to the south and west; the lowest point in the state of Utah is located in the Beaver Dam Wash in Washington County, where it (seasonally) flows out of Utah and into Arizona, at 2,178' (664m) ASL. The county's highest point is Signal Peak in the Pine Valley Mountains, at 10,369' (3160m) ASL. The county has a total area of 2,430 square miles (6,300 km2), of which 2,426 square miles (6,280 km2) is land and 3.6 square miles (9.3 km2) (0.1%) is water. The elevation varies from 2,178 to 10,365 feet (3,159 m) in elevation. Washington County is made up of three major geographic areas; the Colorado Plateau in the east-northeast, the Great Basin in the northwest and the Mojave Desert in the south-southwest. Most of the population is centered in the south-central part of the county near the Arizona border (see St. George, Utah). Most national shopping, dining, and hospitality chains are located here, along with several local businesses. The climate of this section of the county is typical of the Mojave Desert in which it lies; its annual rainfall is 8 inches and it is the lowest elevation in Washington County, making it particularly hot and dry compared to the rest of the county. Most homes are located in subdivisions, contributing to a growing urban sprawl. In Downtown St. George, several local restaurants and stores call this area home, and despite its extremely compact size, it tends to attract many locals and tourists alike. To combat the sprawl (which threatens many nature reserves and increases congestion), growth and promotion is being projected inward to the central area of St. George, with many new centrally located developments being planned and constructed. The center of the city, or downtown, also contains Dixie State University, the only 4-year college within a 50-mile radius. Dixie High School is also located in the downtown area. Most commercial and industrial lots exist in the eastern portion of the Greater St. George Area in eastern St. George and Washington, where land is less expensive and closer to Interstate 15, making it a more viable option for shopping and dining. Rapidly expanding suburbs also exist there, especially in an area known as Washington Fields. Large irrigated farms have been sold to commercial and residential developers to make way for the anticipated need of more housing and business. Pine View High School is in this section and serves the east side and Washington. A new high school is being planned for Washington Fields. The western portion of the urban area contains the suburbs of Santa Clara and Ivins, and the neighborhoods of Green Valley, Dixie Downs, Sunset and Tonaquint. While there is still some commercial and few industrial lots, land is considerably more expensive due to the scenic vivid-red cliffs and volcano lava fields, along with the close proximity to Snow Canyon State Park. This has resulted in the construction of many resort-style communities and gated subdivisions such as Entrada, Kayenta, and the Palisades. Abundant luxurious housing often exceeds $1,000,000 in price. However, there still are plentiful neighborhoods and older houses that tend to be more affordable. This section is served by Snow Canyon High School. The southern portion of the city contains the neighborhoods of Southgate, Bloomington, Bloomington Hills, SunRiver, Desert's Edge (near the airport) and Hidden Valley, and is served by Desert Hills High School. Limitations on development in this area exist due to terrain, and as such, it contains less population than its east and west counterparts. Despite its smaller size, a freeway SR-7, also known as Southern Parkway, has been built as a beltway to accommodate future growth in the southeastern portion of St. George and Washington. The partially constructed freeway also connects to St. George Regional Airport, and in the future, will provide a vital connection to the community of Hurricane, which will thereby provide quicker and more efficient access to Zion National Park, thus providing an alternative route to Interstate 15. Despite its scenic location among red sandstone, lava fields, and the backdrop of the Pine Valley Mountains, the northern area of St. George is almost entirely undeveloped due to the Red Cliffs National Conservation Area, which protects a variety of endangered wildlife and unspoiled desert. The only communities in northern St. George are The Ledges and Winchester Hills in the west, and Green Springs, near Washington, in the east. While the community of Winchester Hills has existed for many decades, The Ledges is a newer development met with significant controversy. A few houses in the gate portion feature what many consider to be multimillion-dollar views of Snow Canyon State Park, and because of this, are visible from inside the state park. This has led many to believe that the beauty of Snow Canyon is in jeopardy due to the City of St. George's willingness to sell the land around the park to private companies. In reality, only three houses are visible from inside the canyon, although more visible lots exist to be built upon. On the opposite end of the city is Green Springs, an upscale multimillion-dollar development, which consists of a golf course and many distinct gated and non-gated housing communities. On the east side of the metropolitan area lies the cities of Hurricane and La Verkin. Because this locale is disconnected from the rest of the area by undeveloped swaths of land, it is still usually considered distinct from urban St. George, however this may change in the future due to anticipated development that will connect these two communities. This area is more farm-based and rural than St. George, but is still enjoying the rapid expansion in commercial, industrial, and residential development like the rest of the region. It is served by Hurricane High School. While the entire county, due to its large size, is considered part of the St. George Metropolitan Area, most land in the county is rural. In the middle and north of Washington County, sparse population exists. The center-county communities of Central and Pine Valley are popular resort communities and contain many cabins and recreational parks, due to their locations in Dixie National Forest and the Pine Valley Mountains. Veyo and Dammeron Valley, also near the center of the county, are primarily ranching towns, with most houses situated on large plots of land. This central area of Washington County is generally more wet and humid than the rest of the county, due to its high elevation and high precipitation. In Pine Valley, precipitation often exceeds 20 inches per year. The northern portion of Washington County is semi-arid and dry, albeit less so than in the southern portion. The only incorporated town in this area is Enterprise which has a population of just over 1,700. Enterprise is the home of the only secondary school outside of the Greater St. George Area, Enterprise High School. The town contains a small grocery store and multiple gas stations, but is very quaint and rural when compared to the bustling urban area of St. George. Western Washington County is home to Gunlock, also a ranching town, and a small Native American reserve named Shivwits, occupied by the Shivwits Band of Paiutes. This area of the county is also the location of the lowest area of the state, Beaver Dam Wash.
Eastern Washington County is also sparsely populated. However, the towns of Rockville and Springdale are filled with major hotels and resorts, despite their small sizes. This is due to their extreme proximity to Zion National Park, one of the most visited national parks in the United States. Springdale in particular contains many kitschy shopping and dining options. Most of the income in these two towns is fueled by tourism alone. The county includes an area along the Old Spanish Trail called Mountain Meadows, just south of Enterprise on SR-18. Zion National Park is located in the eastern part of Washington County. As of the 2000 United States Census, there were 90,354 people, 29,939 households, and 23,442 families in the county. The population density was 37.2/sqmi (14.4/km²). There were 36,478 housing units at an average density of 15 per square mile (6/km²). The racial makeup of the county was 93.57% White, 0.21% Black or African American, 1.47% Native American, 0.45% Asian, 0.42% Pacific Islander, 2.24% from other races, and 1.65% from two or more races. 5.23% of the population were Hispanic or Latino of any race. In 2005 89.7% of the population was non-Hispanic whites. African Americans were 0.4% of the population. Native Americans comprised 1.4% of the population. Asians increased to 0.6% of the population. Pacific Islanders made up to 0.5% of the population. 6.6% of the population was Latino. In 2000 there were 29,939 households out of which 37.10% had children under the age of 18 living with them, 67.60% were married couples living together, 8.00% had a female householder with no husband present, and 21.70% were non-families. 17.50% of all households were made up of individuals and 8.90% had someone living alone who was 65 years of age or older. The average household size was 2.97 and the average family size was 3.36. The county population contained 31.20% under the age of 18, 11.60% from 18 to 24, 22.40% from 25 to 44, 17.80% from 45 to 64, and 17.00% who were 65 years of age or older. The median age was 31 years. For every 100 females there were 97.30 males. For every 100 females age 18 and over, there were 94.40 males. The median income for a household in the county was $37,212, and the median income for a family was $41,845. Males had a median income of $31,275 versus $20,856 for females. The per capita income for the county was $15,873. About 7.70% of families and 11.20% of the population were below the poverty line, including 14.60% of those under age 18 and 4.20% of those age 65 or over. In 2000, 92.5% of residents were adherents of the Church of Jesus Christ of Latter-day Saints; 4.1% Catholic; 0.8% Southern Baptist; 0.6% Presbyterian; 0.4% Lutheran; 0.4% Episcopal; 0.2% United Methodist; 0.2% Baptist; 0.2% Assemblies of God; and 0.5% Other. Washington County School District Office in St. George, Utah. 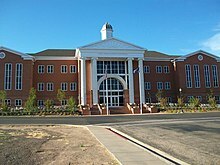 In addition to the primary and secondary schools that compose Washington County School District, Washington County is home to Dixie State University in St. George, with a campus extension in Hurricane. Washington County has traditionally voted Republican. In no county election since 1944 has the county selected the Democratic Party candidate (as of 2016). ^ "Where-the-Jobs-Are: Personal Finance News from Yahoo! Finance". Finance.yahoo.com. July 23, 2008. Retrieved July 22, 2010. ^ "2010 Census Gazetteer Files". United States Census Bureau. August 22, 2012. Retrieved June 26, 2015. ^ St. George, Utah. City-data.com. Advameg, Inc. Archived from the original on November 19, 2013. ^ Bureau, U.S. Census. "American FactFinder - Results". factfinder.census.gov. Retrieved March 31, 2018.